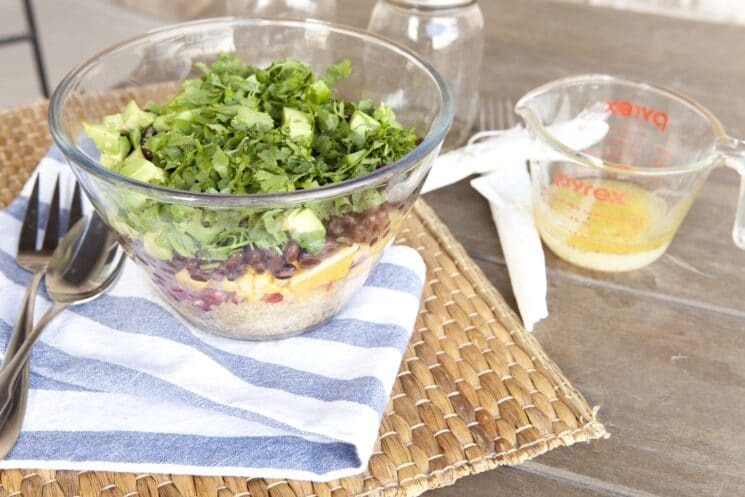 This quinoa salad can be stored in the fridge for days and it just keeps getting better! Super food Salad Recipe! Although there is no official or definitive meaning for the term, Super Food, when we say a food is a “super food” we are referring to a food that is PACKED with nutrients. This is generally a plant based food. When we calculate the number of nutrients per calorie a food contains, plant based foods has fewer calories per nutrient. For example, a food that is only 50 calories but contains 100% of the daily requirement for vitamin C, is more nutrient dense than a food that has 500 calories and only 10% of the daily value for vitamin C.
When kids consume foods that are dense in nutrients like this, they thrive! That is why we encourage super foods in a child’s diet. If a child it’s small quantities, we can at least know they are maximizing the nutrients they are getting from their foods. Why is Quinoa a Super Food? Why are black beans a super food? The dark color of black beans indicate they are rich in antioxidants. 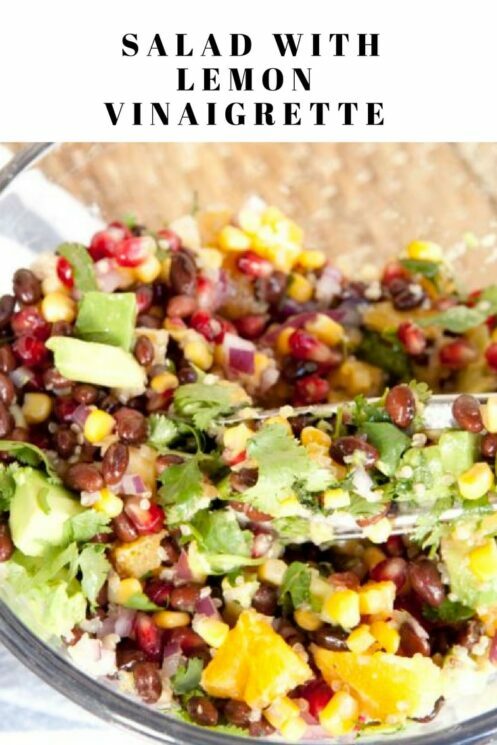 Black beans are also a great source of fiber and protein. Why are Pomegranate seeds super foods? The dark red of Pomegranate seeds are rich in polyphenols. Polyphenols are beneficial to heart health! Find out the fastest way to de-seed a pomegranate here! I love that these are part of this delicious salad! 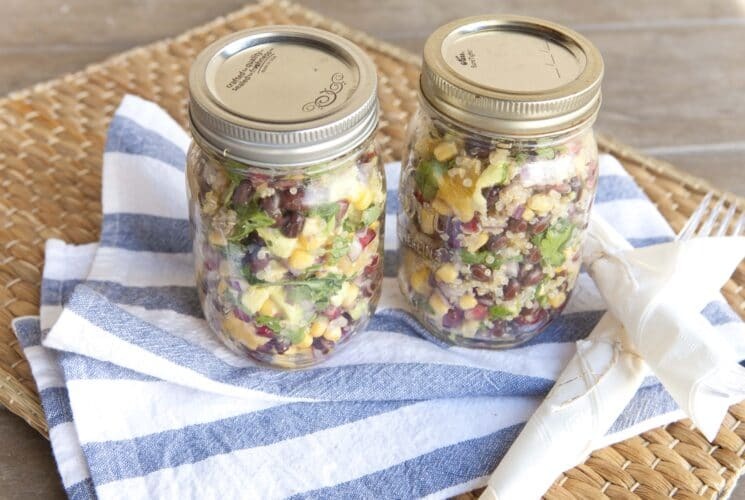 We like to make this salad ahead of time, and store the salad in mason jars. 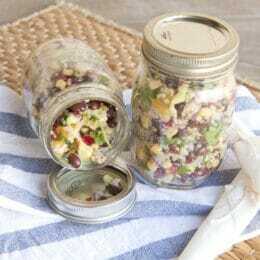 This helps to marinate the quinoa and veggies with the vinaigrette and give the whole salad much more flavor! 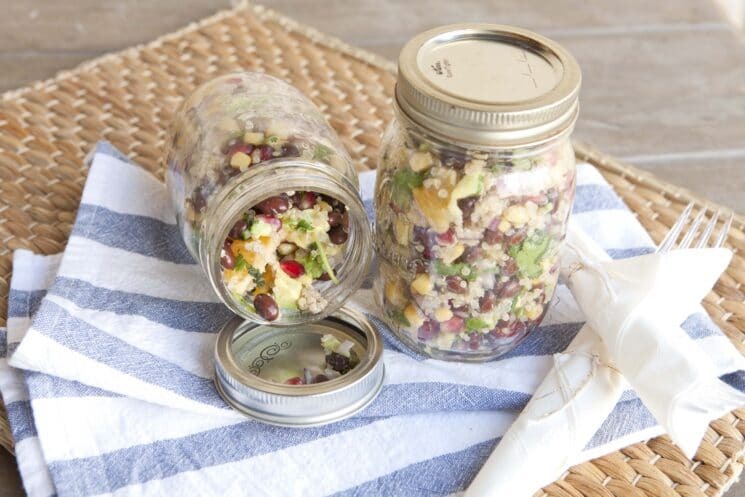 You can then store the jars in the fridge for 3-5 days and the salad stays fresh the entire time! You can also assemble this salad ahead of time and put the dressing on later. 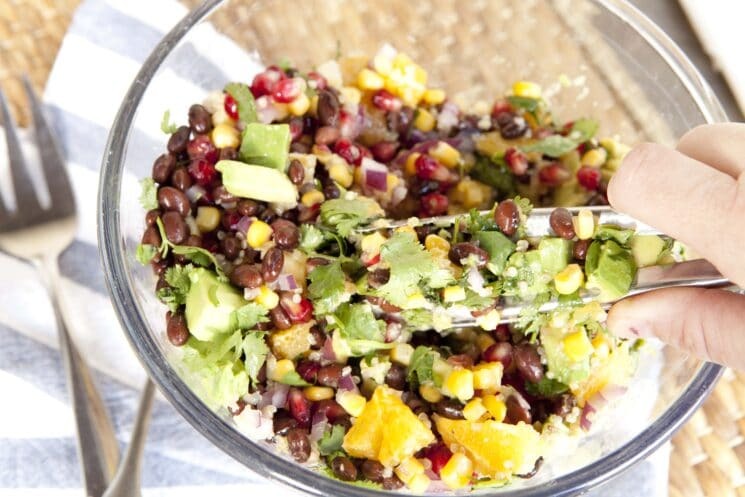 So, give this Superfood Salad a try! I know your kids won’t be disappointed! For the lemon vinaigrette: juice your lemons (you’ll need about 1/4 cup of juice). Mince garlic. Combine the lemon juice, garlic, salt, pepper, olive oil and sugar in a jar with a tight fitting lid; shake to combine. 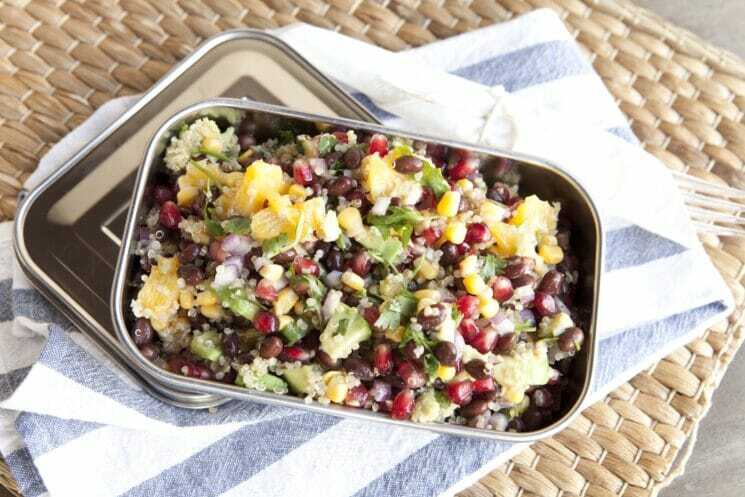 To prepare the salad dice the red onion (about 1/3 cup), peel orange and chop up segments, dice avocado, drain and rinse beans, remove pomegranate arils (about 1 cup), thaw corn, and chop cilantro. 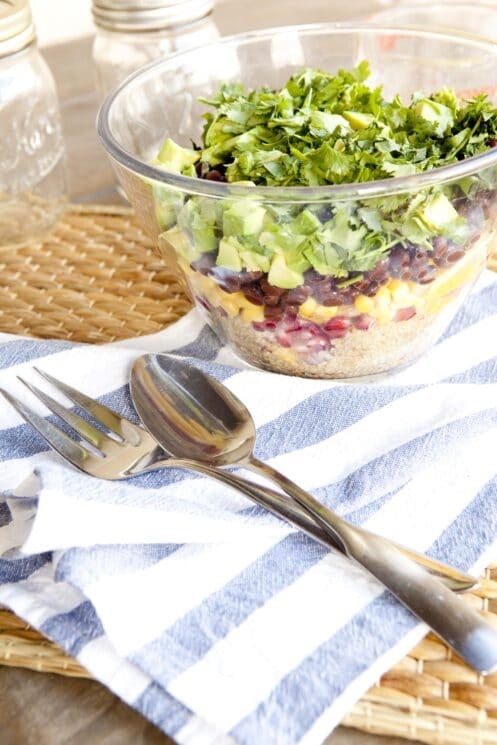 Combine cooled quinoa with other salad ingredients. Pour lemon vinaigrette over the salad and stir to combine.